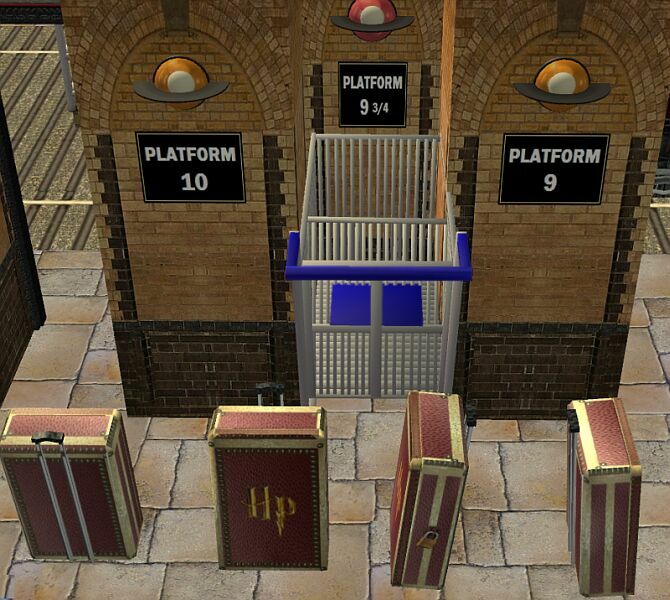 Finally your Harry Potter Sims can travel in style! 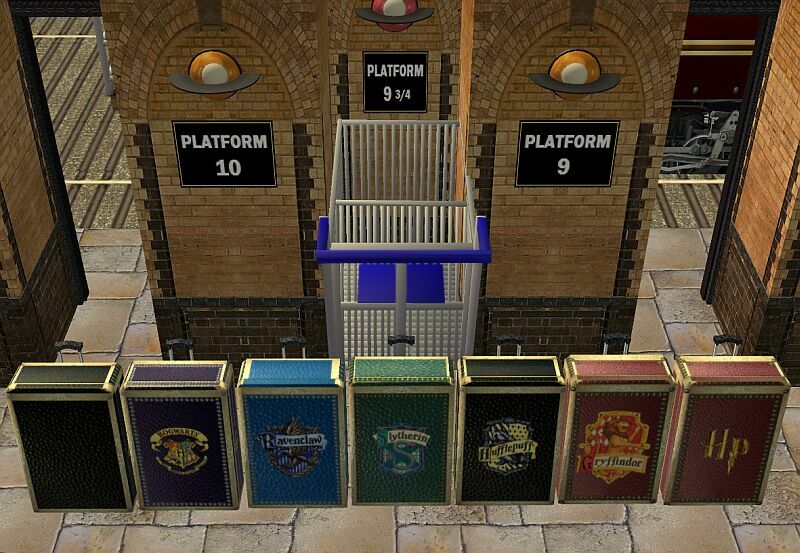 These Harry Potter Travel Trunks are PERFECT for your Potter Sims! This little addition to ALL THINGS POTTER was something I always wanted for my Sims! It was inspired by the Luggage and Cart set by MizzesSimmer. 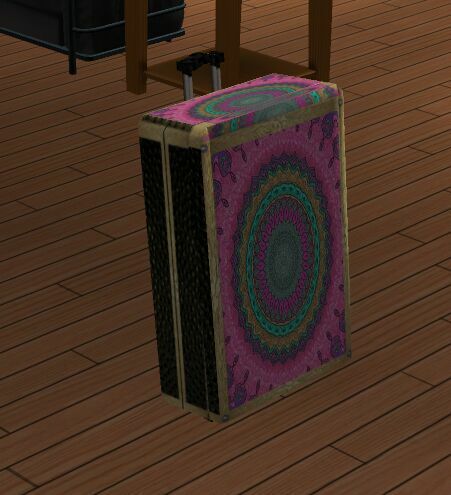 A slightly modified version of MizzesSimmer's luggage suitcase was used to create a mesh and texture map (with permission). The mesh was remapped so that it has 2 recolorable subsets (which allows mix and match). This is a new mesh with it's own recolours. You DO NOT need the luggage set by MizzesSimmer. Unfortunately, MizzesSimmer has deleted the thread and the Luggage Set is no longer available. 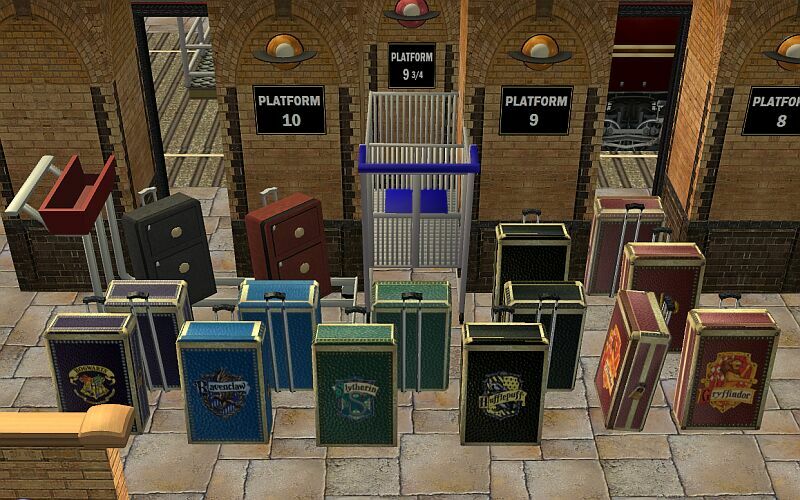 But again, these Harry Potter travel trunks are stand alone. YOU DO NOT MIZZESSIMMER's LUGGAGE SET! Note:The cart and the 2 luggage bags on the cart are from the original creation by MizzesSimmer. This is a collaborative effort between Jason Duskey and myself. Jason modified the meshes in Blender, assembled everything in SimPE and recolored the packages. I created the texture maps and reworked each recolor. Our teamwork once again has paid off! There are two versions available for download here: a decorative version and a functional (dresser) version. Both versions "look" alike. Both versions may be included in the game at the same time as they have separate GUIDs. One will not interfere with the other. You can place either version in the game separately or both versions simultaneously. The decorative version was cloned from the "Sorrowful Scions" sculpture and is base-game compatible. The functional version was cloned from the small "Atomic Kids" dresser and requires Pets. Added a New Barbie Goth trunk called "The LAURA" - dedicated to my dear friend Lauralaima. You may have changed your avatar Laura, but unfortunately you still can't hide that Gothic Barbie Doll image! Note: The Laura download contains the meshes for both the decorative and the functional trunks! You may wish to use "The Laura" for your whimsical Harry Potter characters, like Luna Lovegood. I'm sure she would appreciate it's unique style and color! *The animations on the functional version are slightly off. However, the dresser functions and the Sims will use them to quickly change into outfits! Thank you to MizzesSimmer for inspiring these trunks. A special thank you to mi amigo Jason. Your commitment to helping with my creations has been phenomenal. I am always driven to be better at what I do when working with you! Thanks for allowing me to share these with the Sim community! Tags: #Harry Potter Luggage, #Harry Potter Travel Trunks, #Harry Potter, #Hogwarts, #Ravenclaw, #Slytherin, #Hufflepuff, #Gryffindor, #Basic Black, #Luggage, #Travel, #Suitcases, #Trunks, #King's Cross, #jason duskey, #stephanie b.